Bulgaria, the Republic of Moldova, Romania and Serbia are the 4 countries now set to start policy dialogues in 2019 with the goal of reducing antimicrobial resistance (AMR) at national levels. Experts working on AMR and evidence-informed policy in these 4 countries recently attended a workshop where they learned how to develop evidence briefs for AMR policy. This workshop was jointly organized by the Evidence-informed Policy Network (EVIPNet) Europe operating under the umbrella of the WHO European Health Information Initiative (Division of Information, Evidence, Research and Innovation) and WHO/Europe’s Control of Antimicrobial Resistance Programme, Division of Health Emergencies and Communicable Diseases. Evidence briefs are user-friendly syntheses of the best available global and local research evidence to answer a specific policy problem in a concise way. Seven Member States in the WHO European Region have already embarked on developing evidence briefs on AMR since 2017. The country teams left the workshop with a complete set of working documents, including a detailed work plan and protocol for their evidence briefs on AMR. This gives them a solid foundation on which to build their work in the coming months, with the goal of developing the briefs by early 2019 and planning for deliberative policy dialogues later in 2019. “Our participants got a chance to learn about ways AMR is tackled in different countries; the small group setting was perfect for this exchange. I’m looking forward to seeing what solutions the teams will come up with,” said Dr Saskia Nahrgang, Technical Officer, Antimicrobial Resistance, WHO/Europe. This group was the second EVIPNet Europe cohort to receive face-to-face technical assistance and coaching from WHO/Europe and partners. 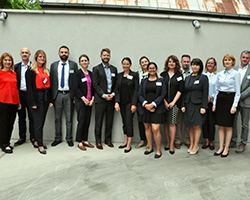 The 3-day workshop was organized in Belgrade, Serbia, on 27–29 June 2018, to consolidate the training they had received online from McMaster Health Forum over the preceding month and to close the research-to-policy gap in the WHO European Region. Dr Zsofia Pusztai, WHO Representative in Serbia; Tanja Kuchenmüller, Unit Leader, Knowledge Management, Evidence and Research for Policy-Making, Division of Information, Evidence, Research and Innovation, WHO/Europe; and Dr Nahrgang opened the workshop. Dr Kaelan Moat, Managing Director of McMaster Health Forum, facilitated the training workshop, with technical support from WHO/Europe representatives. EVIPNet Europe and the AMR programme have established a strategic partnership to support countries in developing evidence briefs focused on AMR. Hungary was the first Member State in the Region to finalize in 2017 an evidence brief as part of the initiative. The same year, 6 additional Member States – Kazakhstan, Lithuania, Montenegro, Slovakia, Slovenia and the former Yugoslav Republic of Macedonia – embarked on this process and attended an initial meeting in Bratislava, followed by a writing workshop in Budapest. As a result, many are now close to finalizing their evidence briefs on AMR. This cross-divisional initiative from WHO/Europe supports both the Global Action Plan on Antimicrobial Resistance and the Action Plan to Strengthen the Use of Evidence, Information and Research for Policy-making in the WHO European Region.